Sprinkle Italian seasoning and garlic powder on top of meat. Add spaghetti sauce and simmer for 10 minutes. While meat sauce is simmering, prepare noodle according to package directions. Drain. 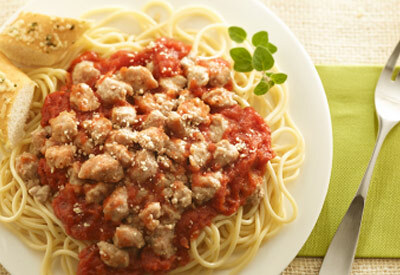 Place desired amount of noodles on each plate and top with meat sauce. Sprinkle with cheese, if desired.